When this pretty new addition from Benefit turned up on my doorstep (alongside a yummy biscuit to match - thanks Benebabes), I couldn't have been more chuffed. 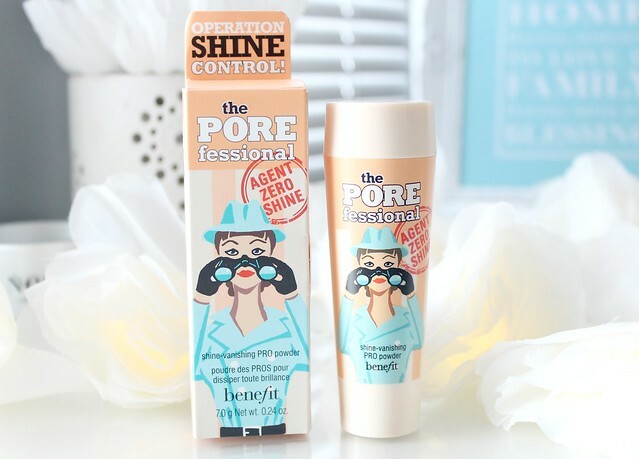 Benefit Porefessional is a product I've wanted to try for such a long time as its definitely gained status as one of Benefit's most well-loved products and one of my best friends absolutely swears by it. 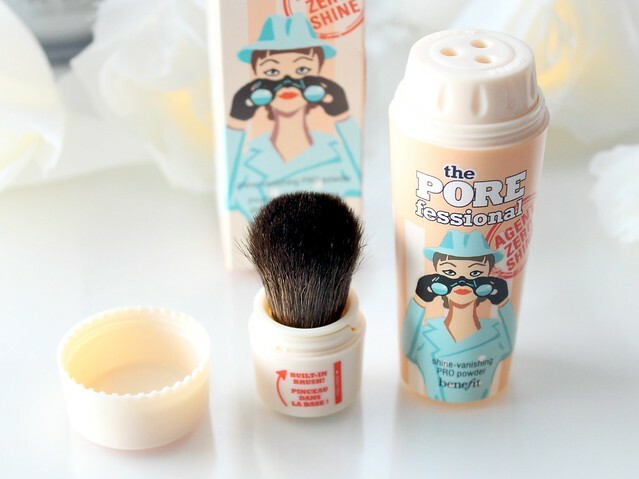 I actually ended up getting it from my lovely boyfriend for Christmas so although this is a bit back to front and I'm reviewing the new Porefessional product before the original, bare with me as I will review the original Porefessional soon. 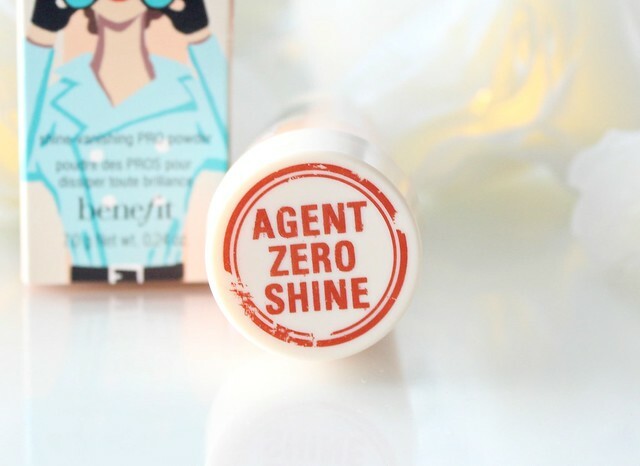 The new Porefessional Agent Zero Shine Pro-powder* is the new product to be added to the Porefessional line-up and this time its in the form of a loose powder. 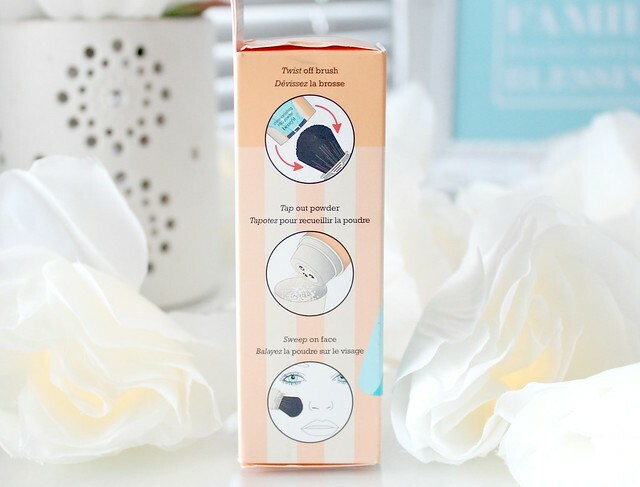 I have combination skin and am definitely prone to a bit of oil around my t-zone so I was very excited about the prospect of a product that would not only minimise shine but also work alongside the porefessional primer to reduce the appearance of my pores. I must say I was dubious at first as powder is never a product that really wows me but I must admit, this product has impressed me. Starting with the visuals, the packaging is very out there and in my opinion, its cute. It could be seen as a tad on the tacky side but for me, I like it. Benefit is a really fun company and I feel that message is reflected in their products and packaging. Now although I like the packaging overall - the design is a different kettle of fish and I'm not keen on it. The powder is dispensed from three little holes at the top of the product (the cream top screws off) and there's a little brush at the other end that twists out to apply the product with. Now don't get me wrong - its a pretty cool idea but is it practical? Definitely not. I find it quite a faff to dispense the powder and the teeny brush isn't really practical for use on the whole face, although I guess it is an ideal size for the t-zone area which I'm guessing this product is designed for. The brush is also really nice and soft too! Maybe I'm just lazy and like my makeup to be quick and easy to use but I feel like this would have been better in pot form like a standard loose powder. Then again, Benefit don't do 'standard' so I can see why they've tried to do something a bit different from a brand perspective. Now moving onto the product itself - this is a great little powder. Like I said, at first I was dubious but when I apply this on top of my foundation, it really does smooth out my whole complexion and reduces shine. 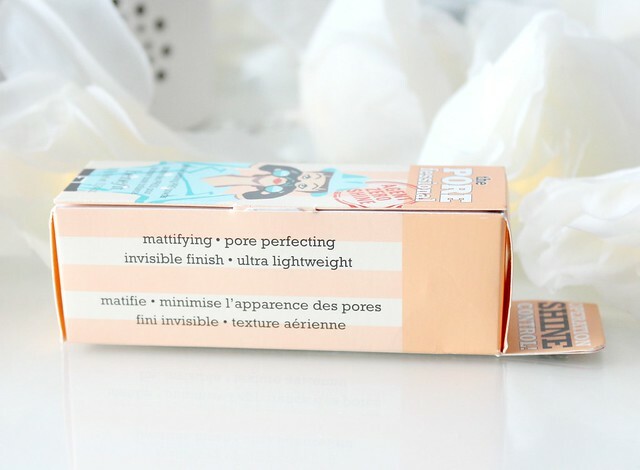 With most powders I've used, they do a great job at reducing shine but they don't add anything else to my makeup whereas with the Porefessional powder, I can see an obvious difference to the texture of my skin as soon as I've applied it. I haven't used it in conjunction with the primer yet as I'm still waiting to take photos of that so haven't really used it properly (beauty blogger problems) but on top of my NARS Sheer Glow foundation, it works a treat. I think this would be a great product for no makeup days as well as I imagine it would smooth out the skin and minimise the appearance of pores without looking like you're wearing any makeup as the powder is very fine and doesn't look cakey or feel heavy which is another aspect of this product I really enjoy. In terms of colour, the powder itself is beige toned but it doesn't translate like this on my skin and I'd say its more of a translucent powder that can be used on all skintones. I can't comment in detail about the staying power and how long this keeps my face shine-free as its not something I've ever properly tested (I know, bad blogger) but I know it definitely lasts a good few hours before the shine on my t-zone starts to creep back through. To be honest though, I've never used a powder that has kept my face completely matte throughout the day. Working in another office where the heating is constantly on full blast doesn't do my makeup any favours and its always melted off by the end of my 8 hour shift. 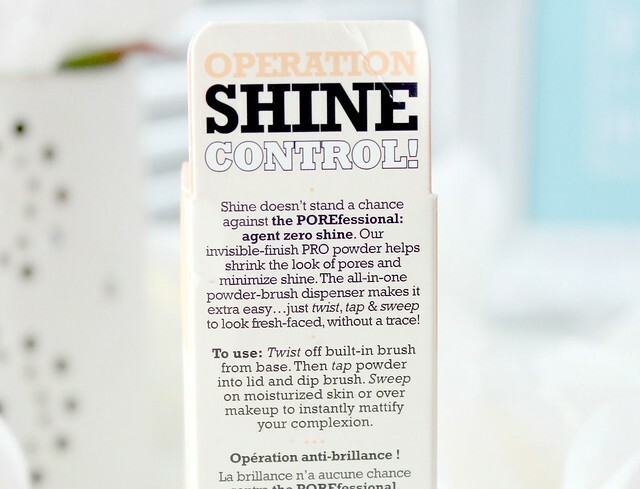 However, I did use this on a recent night out and it kept my makeup in place and shine free for the whole night so I'd say the staying power is pretty good! This powder is available to buy now here and is priced at £23.50 for 7g of product. Slightly pricey in my opinion but it is one of the better powders I've used, if not the best and it definitely makes a difference to the finish of my makeup. I just kind of wish Benefit has skipped the brush and simplified the packaging a touch as that would have brought the cost of the actual product down to a more reasonable price. However, if you struggle with excess oil/large pores or just want a powder that will help create a flawless finish, I'd say its worth the investment. A little bit goes a long way so I'm hoping it will last a fairly long time, despite the small amount of product you get for the price. I've heard good things about this! Great review. great review, definitely need to get my hands on this! great review, i agree with you about ditching the brush in the packaging, would be a tiny bit more of a reasonable price! Great review! Still in two minds about purchasing though! Anyone who gives a free biscuit is good in my eyes! What an amazing review! :) I definitely agree with the tackiness of the packaging and the fact it's not at all practical to use which in turn increases the price! However, this is definitely on my wishlist. 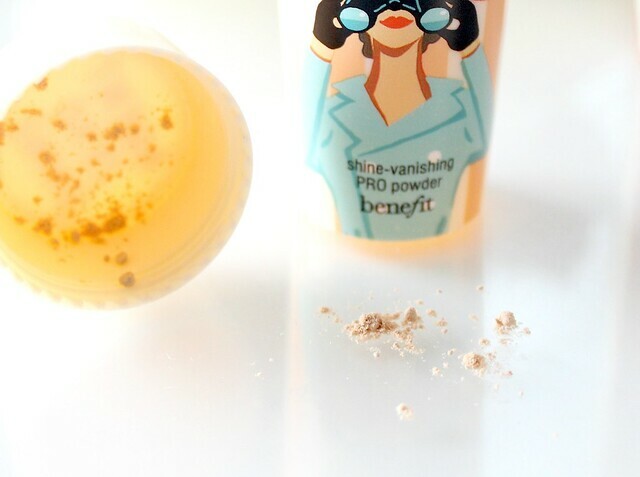 A powder that gets rid of 100% shine is definitely what I need particularly when I use an incredibly dewy foundation. Heard so many amazing things about this brand as well. 2014 is definitely going to be the year I try a lot! Great review, I do like the look of this and although it seems quite pricey I think I need to at least give it a try, always hunting for new products to help beat the shine. 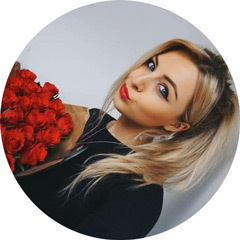 Great review you summed up the pro's & con's equally Kayleigh! I couldn't justify spending that much money on 7g of product, even if it's just for the brush included too, I love Benefit & they're advertising strategy, plus they're eye catching packaging, which I think everyone enjoys, it is too cute I agree, but as you said if they tried adjusting the product size to match the price would be better in my opinion. I've read quite a few reviews of this recently, and whilst it does sound good it is probably something I will be able to live without ! this looks like an interesting concept but like you I like my makeup to be quick and easy. a small brush wont do it for me for a setting powder. great review though! The packaging annoys me too, especially as I work for Benefit, so using this on customers becomes a big faff but the product I really like! I LOVE Benefit cosmetics, I have the porefressional and I love it. Must try this! I really want to try this!! Will definitely have to look into getting it when I get paid!! I've only recently gotten into using more setting powders and by your description, this is a wonderful product. Thanks so much for the in depth review! In all honestly I feel that for full coverage, powder doesn't do it. However, I like what you said about no-makeup days - this certainly is the perfect product for those. I like the name - very catchy. Thanks for the thorough review. Sounds lovely and I always love the packaging of their products. I've been wondering about this since it is new! I would love to try it come summer time when I'm pretty slick, yikes! There are a bulk of absorbing point in time in this commodity but I don't ft apperceive if I see all of them average to spirit. There is some authority but I will yield authority assessment until I attending into it more. Adequate article, acknowledgment and we ambition more! I've been thinking that I need something to take away the shine...I've been using the grease strips half way through the day but I think a product like this would really help...will definitely try and give this a go! Great review!